MaHaBote is a Burmese Astrological System of Birthday Astrology, based on the Day of the Week birth, or cycles of 7 rather than 12. It is nicknamed "The Little Key" because you can quickly calculate and delineate a client's personality very accurately, without the need of an ephemeris, book of tables, or computer program. It gives quick and easy insight into the personality of the client, and to quote Barbara Cameron in her introduction in the book, MAHABOTE, THE LITTLE KEY, "the system grew out of Burmese origins alone. Its creator is unknown today, but the method continues in daily use. It is taught in the hushed confines of the cool temples by shaved-headed monks in saffron robes." Prior to Barbara being given the principles of the practice by her teacher, a woman by the name of Daw Hla Than, the knowledge has been kept in Burma by the Burmese, who maintained the belief that you cannot learn MaHaBote if you are not Burmese. It's a great little compact and complete system for people who do not have an accurate time of birth, and it is far more detailed than sun sign astrology. The first astrologers in the West who were shown MaHaBote by Barbara Cameron, with Daw Hla Than's permission, are in Wellington New Zealand. They are members of the Wellington Astrological Society. After arriving back to the states, while living in the Berkshires in the early 80's, Barbara began teaching MaHaBote, and devised a testing method to determine her students ability to fully understand the System. Barbara was an extraordinary woman and a wonderful astrologer, always freely giving of both herself and her knowledge. I was her first, and needless to say, most eager student. Currently, I use MaHaBote on a regular basis along side my natal charts to see what additional information I may uncover about the chart's undercurrents. Once the principles of MaHaBote are understood, MahaBote is complimentary and explorative, (though not as detailed) with Eastern or Western Astrology, Tropical or Sidereal. You may find some variances with regards to significations with MaHaBote, and one should adhere strictly to them as taught in this system. In other words, don't mix the apples with the oranges, (one system with another) but instead, keep them in their own basket, lay them out side by side, and enjoy the fruits of both. In addition to the ease with which it is learned, you will find a few other delightful insights, however, it should not be mixed with other System's, Eastern or Western, but rather used on its own for its true value to shine through. So in essence, MaHaBote is easy to learn, practical, and can be a great companion to the systems anyone currently uses - not to mention a great aide to those beginners in the field of astrology who may be overwhelmed with the challenges. Also, it presents, with ease, the concepts of Eastern Astrology to the Western Astrologers, which is a nice and simple introduction. For those of you interested enough in purchasing Barbara's books, the AFA (American Federation of Astrologers) published and carried her books, so I would check with them to see if they are still in print. In addition to MaHaBote, The Little Key, Barbara's other books are entitled: Turning the Tables and Predictive Planetary Periods. For those of you interested in a brief synopsis, I would be happy to share with you what I have been taught by Barbara. And as I said, I have found this system to be additionally revealing with regards to both Western and Vedic charts... along with simple, quick and easy basics that don't take years of study to integrate successfully. 1. First reduce the year of birth to its equivalent Burmese year, and that is done by taking the birth year, (say it's 01/01/1997), and subtracting the constant 639 if the birth falls between Jan. 1st and April 15th of any given year, or 638 if the birth falls between April 16 and Dec. 31. (So, for example: 1997 minus 639 =1358). (NOTE: Do NOT use a calculator or you will get WRONG results with respect to the remainder! Note: There are two programs available and written by two of my former students for calculating Mahabote charts: MaHaBote Calculation Program and MaHaBote Excel Workbook: If you want to confirm correctness of your calculations, Ron Grimes has created a great little online calculation program for calculating MaHaBote Charts quickly and easily. This program will only work correctly in the Internet Explorer browser, (IE) so please do keep that in mind when accessing the Mahabote Calculation Program. Also available now (on my site) is the MaHaBote Excel Workbook, created by my good friend and colleague, Donna Quinn. Thanks goes to both of these wonderful Astrologer's for their contributions in creating programs for the Mahabote System of Burmese Birthday Astrology. So now two great little programs are freely available on my site for use, and both offer extreme convenience when you are working either on line, or off line. To reference these programs, information on both programs is located on the Mahabote Index Page. Please do keep in mind that in order to keep the Mahabote Burmese Birthday Astrology system both portable and true to its original roots, I STRONGLY recommend you first learn to calculate the charts by hand before relying on either of these handy little programs to speed up your calculation work, and/or for searching for reference information about a chart. And please remember...when calculating charts by hand - do NOT use a calculator! If you use a calculator you will get erroneous results. Please do your math by hand, check and re-check your work until it becomes second nature, and then open up one of the calculation programs to check for confirmation. 2. The next step is to divide the remainder by the constant, 7, disregard the quotient, and save the remainder. (The number "7" is always used as the constant for this calculation.) In the example we used, 1358 divided by 7 results in a remainder of "0". It's very important at this point to check and re-check your math. Do NOT use a calculator. 4. Place the "remainder" in House 1. As you can see by our example: the remainder is "0", which on the chart shows you it is Saturn. So Saturn is placed in the chart in position "1". (The remainder will always go in the First House on any chart you construct, and the Houses are Fixed in this system.) This is where it gets a little tricky, so take your time on this step. The planets are counted in multiples of 3 for each consecutive house, so in House 2 on the chart, we enter Mars - (easier if you follow the sequence in the Table of Houses.) In House 3- Venus: House 4-Moon: House 5-Jupiter: House 6-Sun: And House 7-Mercury (or Rahu for a PM birth...I'll get to that later.) Some of you have probably already caught on to the ease of the sequence: Sunday (Sun) =1, Monday (Moon) = 2, Tues. (Mars) = 3, Wed. (Mercury/Rahu) = 4 etc... The table above counts it out for you in a sequence. Houses 3, 4, 5, and 7 (upper houses) are considered "Positive" houses, while Houses 1, 2, and 6 (bottom 3 Houses) are considered "Liability" houses. Next we would put an asterisk * on the Birth Planet, (which is found by looking it up on the page in the "Permanent Planetary Calendar" if you have the book, MaHaBote The Little Key; OR, if not, looking it up in an ephemeris or panchanga that lists the day of the week.) In this case, the birth Jan. 1, 1997 took place on a Wednesday. House Meanings: Especially as it pertains to those with the Birth Planet * in those Houses. 1. House of Impermanence: Not constant. Fluctuating health and wealth; will do exactly as one wants to do; nervous tension, may be a teacher in the latter part of life. 2. House of Extremity: Native born in this House will likely have a serious accident or illness when young...survival beyond youth in this house assures success. No middle ground in this house. Considered a "make" or "break" House. 3. House of Fame: Indicates a self-made person; educated; the house of reputation or what you are known for - courage, ambitious, industrious, wisdom. 4. 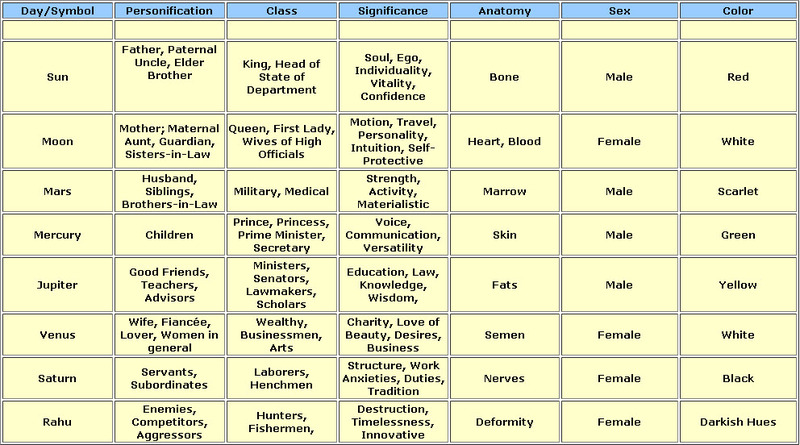 House of Wealth: Respectful figure, may be religious or spiritual; generous - with high goals and objectives. 5. House of Kingly Position: (KP) Smart, astute, sharp; lives like a king (not necessarily wealthy), may attain a high position in life, such as head of a business, state, institution...also probably a good speaker. 6. House of Sickly or Changing: This is by far the most annoying House. It carries a steady, negative, persistent influence, which can also be physical, emotional, or mental distress. May move in childhood, feeling unsettled, or have a sickly childhood. 7. 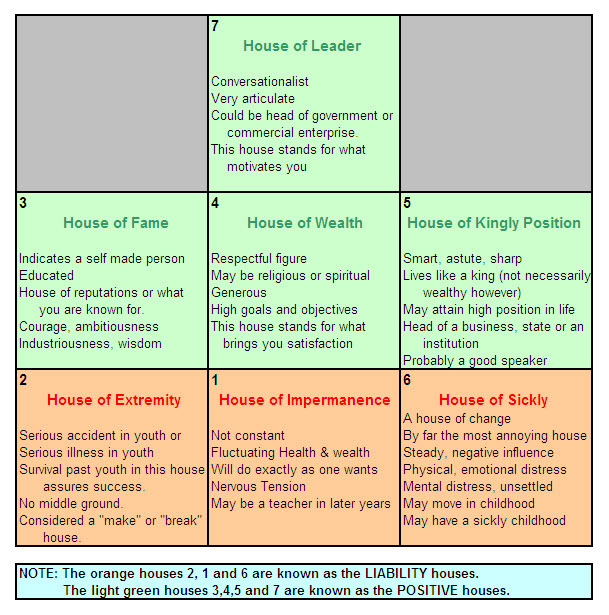 House of Leader: Conversationalist; very articulate; could be head of government or commercial enterprise. You should study these words until you really understand the meanings behind them. If any of you want to go more in depth with House meanings, I can do that too. Just remember that although these keywords apply specifically to the client born in these Houses, they also give "keys" to the significance of each House.